TERRAZA BRINGS BUICK STYLE AND SUV REFINEMENT TO PREMIUM MID-VAN SEGMENT - Buick has a long-earned reputation for transporting families in a premium way. Terraza, the third entry in Buick's growing truck portfolio, continues this tradition, bringing Buick refinement into the growing premium end of the mid-van segment. The horsepower and torque of the overhead valve 3500 3.5-liter V-6 provide excellent launch feel and responsive performance at all driving speeds. Its estimated power ratings - 200 horsepower and 220 lb.-ft. of torque - are highly competitive with those of other mid-vans. A Terraza-exclusive standard independent long-and-short-arm rear suspension with automatic load leveling and a unique Ride and Handling package provide premium ride. These features, combined with the new world-class braking system that includes larger 16-inch brakes and four-wheel-discs, 17-inch tires, and the availability of StabiliTrak - GM's advanced Vehicle Stability Enhancement System (VSES) - provide superior handling and control in almost any driving condition. Terraza's VSES maximizes handling, braking and acceleration dynamics by using a combination of systems, including stability enhancement, anti-lock braking system and traction control. Terraza takes quietness to the next level with exclusive QuietTuning that provides one of the quietest interiors in the segment. Modifications made throughout the vehicle make this possible and include a forged steel crankshaft, increased engine isolation and other interior acoustic treatments. The blend of SUV and mid-van styling cues gives this new crossover sport van a distinctive exterior appearance. Terraza puts an elegant spin on its rugged look with its monochromatic appearance combined with chrome highlights on the grille, body-side moldings, door handles and the rear license plate brow. Inside, Terraza provides the comfort and elegance customers have come to expect from Buick. The clean, uncluttered and highly functional space is enhanced by wood trim and chrome highlights on the steering wheel, instrument panel and center control stack. Doorplates are also executed in dark burled wood with bright accents and the front doors feature chrome sill plates. Beautifully styled instrumentation and gauge facings further enhance the premium environment unique to Buick. Terraza features standard seven-passenger seating with captain's chairs in both first and second-rows. Seats are upholstered in soft Nuance leather and French, double-stitched seams. Contrasting color piping adds a further touch of stylish elegance unique to Buick. Terraza is engineered to be among the safest vehicles in the segment. Designed for outstanding performance in real-world crashes, Terraza will help protect occupants and also will help avoid crashes in the first place. The biggest changes involve structural enhancements to the frame. The frame is designed to achieve effective crush, helping preserve occupant space while absorbing energy. A longer front-end compartment provides more crush space, while the longer, stronger, more heavily reinforced motor compartment side frame rails increase energy absorption during frontal impacts. This design is conducive for crash compatibility. The extensive use of high-strength steel is behind many of Terraza's structural enhancements. All seven seating positions have three-point safety belts, with more effective load-limiting retractors with pretensioners. In addition, Terraza offers a LATCH (Lower Anchors and Tethers for CHildren) child safety seat restraint system in all second-row seats, and the center position of the third-row seat also provides a top tether bracket for child seat attachment. The CSV has standard, front dual-stage air bags for both driver and front passenger. They are designed to inflate with greater or less speed and pressure depending on the crash severity. Optional seat-mounted side air bags now also provide head and torso protection for the both the front passenger and the driver. Terraza makes crash avoidance a priority as well. A variety of standard and optional features are designed to help drivers avoid accidents in the first place. Features such as daytime running lamps, a new advanced brake system, anti-lock brakes, traction control, StabiliTrak and all-wheel drive all contribute to the vehicle's overall driver security. From headlamps to disc brakes, seat foam to power sliding doors, Terraza is engineered for quality. Attention to detail and craftsmanship further enhances that quality. In response to customer feedback on the current generation of mid-vans, GM improved several key vehicle features and design elements for the Terraza. Terraza benefits from standard 16-inch, four-wheel disc brakes. The entirely new, world-class foundation brake system provides more stopping power, better pedal feel, smoother and quieter operation and longer pad life. Dual cavity, four-halogen-bulb headlamps provide twice the lighting intensity of predecessor models. This segment-first design provides great visibility in both low- and high-beam conditions. Electrical reliability also has been improved by significantly reducing the number of connectors, terminals and splices and increasing the number of sealed connectors, while reducing the number of unsealed connectors. 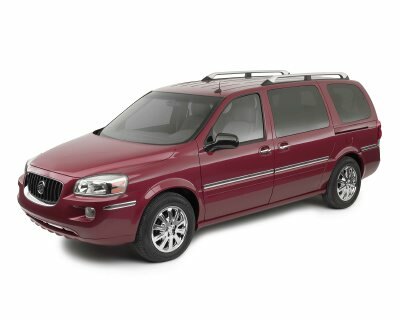 The 2005 Buick Terraza blends the functionality and elegance of a premium midsize passenger van with the tough, rugged appearance of an SUV. While Terraza provides the functionality mid-van customers are looking for, this crossover sport van is sportier and more expressive, with an SUV-like appearance and exterior styling cues that suggest power and strength. "Customers will be proud to be seen in these new vehicles," said Jack Folden, design director for GM's front-wheel-drive truck team. "We took the best features of a mid-van, such as low step-in height and sliding side doors, and wrapped it in a stronger, more powerful-looking package." The squared-off front section and high hood line immediately suggest an SUV - until customers see the reassuring sliding side doors. The front profile, more vertical and squared off than today's mid-vans, telegraphs the presence of a capable engine beneath the hood. The gently sculpted forms, however, are distinctly Buick. "Visually, everything is integrated and flows together," Folden said. The front end, like the rest of the vehicle's exterior and interior, features high quality fit-and-finish, in which tolerances have been tightened and gaps closed to create an integrated, smooth-flowing design from one body panel to the next. Wide, prominent, exposed C-pillars - another SUV styling cue - reinforce the van's strong, durable look, as does the prominent Buick grille. Large 17-inch wheels and wider tires also contribute to the vehicle's sturdier, more aggressive SUV-like stance. The new optional roof rack completes the picture. This unique sport rack has tubular-shaped, satin finish side rails, which gives the vehicle a rugged look. For a distinctive, more refined appearance, Terraza has a single-color exterior, which is highlighted with bright chrome accents. Terraza's prominent grille is a trapezoidal rendition of the classic Buick design, with chrome surround and vertical bars reminiscent of the Buick Centieme concept vehicle. Chrome is dominant on the surround and the front emblem, with the dark grille recessed slightly to accent the chrome. A high-up chrome accent runs along the entire side of the vehicle for a rich appearance, door handles are chrome and the "Buick" name is embossed into the bright-finish rear license plate brow. Besides the standard wheel-cover offering, two other uplevel sets of wheels are available: one, painted bright aluminum with cylindrical spokes carved out at the bolts, the other featuring a cladded bright chrome finish. Terraza's interior design provides the comfort and elegance customers have come to expect from Buick. The leather-wrapped three-spoke steering wheel is color-keyed and features rich, dark burled wood-tone spokes. A matching wood grain is used for the radio and HVAC trim plate as well as the "spear" that divides the upper and lower instrument panel. The radio controls feature unique chrome detail which is echoed in the control plates on the doors. The uplevel CXL adds a wood-trimmed shifter knob to match the steering wheel spokes, and sill plates with chrome inserts featuring the "Buick" name. Terraza seats are distinguished by piping in a contrasting color with a matching deck stitch for an elegant look usually found on high-end luxury brands. Terraza CX seats will have cloth inserts with leather bolsters in the first two rows, while the uplevel CXL will be equipped with leather seats in the first two rows. Drivers and passengers alike will appreciate the comfort and convenience that enable Terraza to set new benchmarks for user friendliness. "We designed the interior so people would feel at home," said Michael Stapleton, design manager and lead interior designer for the new crossover sport vans. "When you step into a Terraza, the interior feels elegant, clean and uncluttered. We had contemporary furniture in mind when we designed it - clean lines, high quality and an absence of visual 'noise.' Everything has a place and makes sense." Featuring integrated, contemporary design elements, the interior reflects high levels of craftsmanship and attention to detail. GM engineers benchmarked the best of competing Japanese and European vehicles to provide Terraza with world class fit and finish. They went all out to tighten gaps and create clean, flush surfacing. Terraza delivers all the utility of a mid-van in a smooth, quiet package that drives and handles more like a BUICK sedan. Drivers have come to expect quiet cabins, a smooth controlled ride, and plenty of power from a Buick. Now, with the 2005 Terraza, Buick brings these hallmark sedan attributes to the mid-van market. Features like 17-inch wheels and tires, a rigid chassis structure, 121-inch wheelbase and independent front and rear suspension provide ride and handling that's more car-like than truck. Offered in front-wheel (FWD) or all-wheel drive (AWD), Terraza features standard independent front and rear suspension. McPherson struts and stabilizer bars are utilized in the front to provide responsive maneuvering. The rear suspension employs aluminum short and long (SLA) control arms for improved stability, particularly when corning over rough pavement. Terraza's ride is further enhanced by its standard self-leveling monotube air shocks in the rear. The hydroformed, four-point isolated chassis cradle also contributes to better ride quality due to improved structural rigidity. Buick's exclusive QuietTuning approach to noise abatement, first introduced on Rainier, reduces interior noise levels on Terraza. A forged crankshaft and hydroformed chassis cradle cuts down on engine vibrations transferred into the cabin. In addition, Buick adds an acoustical engine cover, thicker front-of-dash matt and other interior acoustic enhancements. All this adds up to a hushed passenger compartment that dramatically contributes to Terraza's comfortable ride. Terraza offers plenty of power for this segment with General Motors' new 3500, 3.5-liter V-6 engine. The estimated 200 horsepower and 220 lb.-ft. of torque of this overhead valve engine provide excellent launch feel and responsive performance at all driving speeds. Despite this outstanding performance, the 3500 offers fuel economy that is near the top of the mid-van class. Combined with a 25-gallon fuel tank, customers won't be stopping for fuel very often. The new 3500 has a multitude of refinements to improve performance, reduce noise and vibration, and reach higher levels of quality, reliability and dependability. The 3500 debuted on the 2004 Chevrolet Malibu. The engine incorporates a cast-iron block and aluminum cylinder heads. The Buick Terraza features an exclusive forged steel crankshaft, which provides a quieter, more refined engine sound. In addition, a sequential electronic multi-port fuel injection (SPFI) system brings smoother, more efficient combustion and increased performance. The 3500 also incorporates the latest in emissions technology, using a faster and more precise ignition system, a returnless fuel rail with improved fuel injectors, close-coupled catalytic converters and a fast-response oxygen sensor. The 3500, the newest in GM Powertrain's proven 60-degree OHV V-6 engine family, is manufactured at Ramos Arizpe, Mexico. Terraza transfers power to its wheels with GM Powertrain's proven and reliable Hydra-Matic 4T65-E transmission - a four-speed, electronically controlled automatic overdrive transaxle. The 4T65-E has been continually refined to deliver outstanding shift smoothness, excellent fuel economy and reduced noise and vibration. The transmission also incorporates an innovative Power Take Off Unit (PTU) in AWD applications. The 4T65-E features several noise-reducing design measures, including a refined transmission pump and double-link chain drive. The 4T65-E uses sophisticated electronics to modify shift patterns as conditions dictate. The powertrain control module (PCM) monitors throttle position, vehicle speed, gear range, temperature and engine load to continually ensure optimized shifting. The PCM also measures changes in the operating condition of the vehicle, which occur naturally over time as components wear. Based on these measurements, shift timing and hydraulic line pressure are adapted to maintain optimum shift feel under different conditions. In addition, the PCM allows the system to self-adjust for minor variations in each new unit, ensuring that every customer experiences consistent performance; it also ensures the transmission will produce a constant high level of performance over the life of the vehicle. The 4T65-E is manufactured in Warren, Mich.
Front-wheel drive is standard on the Buick crossover sport van, but Terraza is also available with GM's exclusive Versatrak all-wheel drive system. Developed by GM Powertrain and driveline supplier Steyr-Daimler-Puch, Versatrak is lightweight, quiet and efficient and one of the most advanced approaches to all-wheel drive. With the optional Versatrak system, Terraza operates in front-wheel drive mode until the system detects a driving condition that would be appropriate for AWD. The on-demand Versatrak system goes into action automatically, with no buttons to push or levers to move. Versatrak is especially handy in day-to-day low-traction conditions such as gravel roads, mud, wet grass and snow. The system is poised to help drivers make use of the traction available by not only transferring torque from front to rear, but also from side to side between the rear wheels. AWD engagement is so smooth and progressive that it's transparent to the driver and passengers. For FWD models, Terraza offers StabiliTrak - GM's advanced Vehicle Stability Enhancement System (VSES), which greatly improves safety, stability and control on all road surfaces at all speeds. Its precise, all-weather control is particularly beneficial when driving on slick road surfaces or during emergency maneuvers such as when a driver swerves to avoid an object on the road. VSES maximizes handling, braking and acceleration dynamics by using a combination of systems, including stability enhancement, ABS and traction control. StabiliTrak's sophisticated sensors continually monitor the driver's intended and actual vehicle path and makes adjustments accordingly. The system is always on, constantly measuring steering angle, wheel speed, brake pressure, lateral acceleration and yaw rate (vehicle rotation rate such as during cornering). StabiliTrak is automatically enabled - without the driver having to do anything - providing full stability, traction and ABS control whenever the van operates in forward gear. In adverse conditions, if the van is understeering or oversteering, StabiliTrak quickly and precisely adjusts brake pressure at individual wheels to help the driver steer in the desired direction. The system also adjusts engine power via the electronic throttle control, as required, to help maintain vehicle stability and improve acceleration. StabiliTrak is not available on vans equipped with the Versatrak AWD system. Customers expect safety, and Buick's first entry in the mid-van market, the Terraza crossover sport van, is among the safest vehicles in the segment. Designed for outstanding performance in real-world crashes, Terraza will help protect occupants and avoid crashes in the first place. "From the beginning, we engineered the Terraza for safety," said Anna Kretz, vehicle line executive for front-wheel-drive trucks. "In a variety of ways large and small, we've made sure that these vehicles will help protect everyone who travels in them." The biggest changes involve structural enhancements to the frame. The frame is designed to achieve effective crush, helping preserve occupant space while absorbing energy. A longer front-end compartment provides more crush space, while the longer, stronger, more heavily reinforced motor compartment side frame rails increase energy absorption during frontal impacts. This design is conducive for crash compatibility. While the front end was designed to achieve effective crush, the occupant compartment was designed to be stiffer, to help protect occupants. For offset front impact performance, the A-pillar and the roof rail have been reinforced. The front doors also have been strengthened and stiffened with an additional inner reinforcement at the belt line for further improvements in offset front impact performance. An altogether new sixth cross member has been added to the frame to provide more support for mounting the first-row seats. "The extensive use of high-strength steel is behind many of Terraza's structural enhancements," Kretz said. These improvements are expected to result in good performances in consumer metric tests. Ultimately, GM designed these vehicles to help protect occupants in potential, real world crash situations. Crash avoidance is a priority at Buick and Terraza offers many features specifically designed to help keep drivers out of trouble. One such feature is Terraza's powerful 16-inch four-wheel disc brakes, which result in shorter stopping distances and improved pedal feel. Anti-lock brakes are also standard. The Delphi 7.4 ABS Brake Control provides fast response and superior wheel slip control on most road surfaces with low noise and minimal harshness. All seven seating positions have three-point safety belts, with more effective load-limiting retractors with pretensioners. Pretensioner front safety belts help minimize forward movement during a frontal collision. During a collision, the pretensioners are activated to cinch the belt tightly on the occupants and minimize their movement, while the load-limiters act as energy-absorbing elements that help to regulate the deceleration forces that they experience. In addition, Terraza offers a LATCH (Lower Anchors and Tethers for CHildren) child safety seat restraint system in all second-row seats. This system uses two rigid lower anchors and a top tether to safely secure a child seat to the vehicle seat structure. These anchorages are designed to make it easier to properly install compatible child safety seats. The center position of the third-row seat also provides a top tether bracket for child-seat attachment. Terraza has standard, front dual-stage air bags for both driver and front passenger. They are designed to inflate with greater or less speed and pressure depending on the crash severity. Optional seat-mounted side-impact air bags now also provide head and torso protection for the both the front passenger and the driver. In the event of side impacts, Terraza has sensors that aid the central air-bag control unit, which determines whether the crash is severe enough to warrant air-bag deployment. In addition, Terraza has GM's Passenger Sensing System (PSS). PSS uses the latest sensing technology to detect front passenger weight and pressure on the safety belt. If the sensor system detects an unoccupied front passenger seat or the presence of a smaller occupant or child seat, the front passenger air bag is deigned to automatically turn off so it would not deploy in the event of a frontal collision. A status indicator on the instrument panel alerts occupants that the passenger air bag is on or off. Even with this system, GM strongly recommends whenever possible to restrain child passengers in a child seat placed in the second or third row of the vehicle. Terraza delivers the utility and flexibility that mid-van buyers are looking for, with features that elevate the experience. Only Buick could provide this surprising combination of comfort, reconfigurability and thoughtful amenities. Comfort is always a priority at Buick. Whether on cross-country trips or quick jaunts around town, drivers and passengers alike will appreciate the comfort and craftsmanship of the three rows of seats. The second and third row seats are both foldable and removable. The standard second-row captain's chairs, equipped with armrests, fold flat to permit carrying long objects without having to remove the seats. The 50/50 split, fold-flat third-row bench seat provides the flexibility busy people need for their active lifestyles. "The third row can be split, leaving room for passengers and their stuff," said Chris Mazglad, marketing director for Buick trucks. "Bought a week's worth of groceries? Hauling equipment for the entire girls' softball team? Terraza has ample room. You can fold down the third-row seats to create a flat load floor then simply load in whatever is necessary onto the flat load floor, into the cargo convenience center, or both. In the meantime, you don't have to move anything you previously stowed in the cargo convenience center." Terraza also features two handy fold-down convenience trays between the captain's chairs in the first and second row. Each tray provides four cupholders (even Big Gulp size), a convenient surface for food, playthings or other materials, and a rear pull-out feature to make the tray and cupholders handier to second and third-row passengers. The trays fold down to ensure an easy walk-through rearward. "From a practical standpoint, we know that storage space and a quiet, comfortable ride mean the world to our customers," Mazglad said. "With Terraza, we were able to give drivers and passengers exactly what they asked for." Terraza benefits from a new front overhead console and a standard overhead rail system - a first in the segment. The rail system neatly integrates the rear HVAC and audio controls, lighting and rear-seat entertainment system/DVD into a single unit. Its snap-in storage and accessory modules provide more functional, flexible storage, and contribute to the van's clean, uncluttered look. Each of the three storage modules is about 12 inches wide and 9-10 inches deep, with doors that flip open. These allow customers to snap in any of a variety of specially designed inserts, for items such as CDs, DVDs, sunglasses, cell phones, PDAs, or a first aid kit. Seatbacks also provide a unique storage opportunity. No more stepping on headphones or other small objects. With both enclosed and exposed storage areas, there's a place for everything and everything has its place. The crossover sport van also offers a spacious and flexible cargo system at the rear of the vehicle. With its doors closed, the box-like cargo system's height is flush with that of the folded third-row seat, providing a level load floor for carrying items behind the second row. The cargo system's doors are split down the middle to line up with the split/folding third row seat. This allows folding or stowing one side of the seat and one side of the cargo system and creating a flat load floor for carrying long objects on one side while permitting passengers to sit on the other side. The cargo system has three dividers, running from front to rear, which create four storage compartments, thoughtfully sized to hold such items as milk and orange juice containers, 12-packs of soda, and grocery bags. The forward edge of the dividers is cut out to create a long, left-to-right compartment, capable of storing long items such as golf umbrellas. Terraza offers many entertainment options beyond the standard AM/FM/CD eight-speaker premium sound system. Buyers can upgrade to a system with a six-disc in-dash CD changer or even opt for the available integrated navigation radio. XM Satellite Radio is also available. An available "tri-mode" entertainment system allows occupants to listen to as many as three separate entertainment sources simultaneously--DVD, CD and radio--through the speakers and dual-channel headphones. The optional rear-seat entertainment system includes a DVD player with flip down screen and integrated controls. Passengers can listen to audio through the speaker system or via headphones. A parental control switch allows front-seat passengers to temporarily shut down the unit's audio and video functions. The DVD unit also provides auxiliary video and audio inputs for video games and camcorders. A parent could record a child's soccer match, for example, and immediately play it back from the camcorder on the DVD system's screen for the ride home. Additional entertainment features will be introduced at a later date. In addition, the seat back storage system offers a logical place to store headphones, a remote control, personal CD players, video games or magazines. In addition to standard audio sources (AM/FM/XM/CD), the navigation radio provides drivers with detailed driving routes from coast to coast. This DVD-based system is a supplement to OnStar and displays maps on a display screen in the vehicle. The system is operated via touch-screen controls located in the center stack. Some functions can be controlled through voice commands. The crossover sport van also boasts a driver information center, which displays travel calculations, time and temperature, warning messages and personalized information. Driver security is enhanced with the new Generation 6 OnStar on Terraza. The simple three-button control allows for direct access to OnStar advisors or emergency assistance. The OnStar system also offers hands-free Personal Calling in addition to the standard Safety and Security services. Redundant steering wheel-mounted radio controls allow for safely selecting radio stations or station pre-sets, volume adjustment or muting the system without looking away from the road. Individualized comfort is easy with standard tri-zone comfort control. The driver and front-seat passenger can adjust temperatures to their own individualized comfort setting using manual controls on the instrument panel. There is also a separate setting for the rear. all models: independent, MacPherson strut with coil springs (27 Nm); L-shaped stamped lower control arms and aluminum knuckles. FWD: fully independent ("double wishbone") with cast aluminum short- and long-arm control arms, cast aluminum cradle. AWD: fully independent ("double wishbone") with cast aluminum short- and long-arm control arms, cast aluminum cradle. Rear-drive module integrates suspension and propulsion functions into one unit.